Kevin O' Brien architected one of the most amazing innings of World Cup history, elevating Ireland from almost a lost cause when they were tottering at 111-5 to secure the biggest run chase of all the World Cups against England. O'Brien stunned the cricket world with the fastest century of World Cup history off 50 balls, and nullified the notion that associate members cannot stun their bigger oppositions. 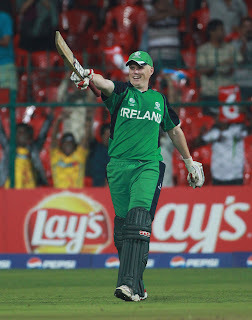 O'Brien together with Cusack went onto bring the highest 6th wicket partnership of 162 which anchored Ireland home.They stunned Andrew Strauss , his team mates, and most importantly broke hearts of the English people. After securing a massive of 327/8 , with England batting first, they were always confident of defending their total with Trott scoring 92 , and half centuries from Ian Bell and Pietersen. Mooney was the pick of the bowlers for Ireland took 4-63. England started off pretty good, with a wicket of first delivery of Irish innings, removing captain Porterfield , bowled by Anderson. Few mini partnerships also came when Stirling, Joyce, and wicket keeper O'Brien paved Ireland to 104-4. But Swann went on to strike for England who ripped the middle order and finally Ireland were in a disaster at 111-5. England , on other hand might not have thought what has coming their way until Kevin O'Brien opened up his shoulders and showed English bowlers with worth. With flurry of boundaries rushing all over, England bowlers were at awe of what they were experiencing. He along with Cusack anchored the most important record partnership of 162, together they switched on destruction mode, bringing 62 runs of the last batting powerplay(31-36). Finally O'Brien managed to score the fastest century of 50 balls, and savoured his achievement joyously. Even after losing wickets,most importantly of O'Brien Irish tempo kept on going as Mooney played a great cameo scoring an un-beaten 33 of 30 also hit the winning runs. Finally all they saw, jaw-dropping sensational game of cricket , as they snatched victory from almost a lost cause and converting into a record breaking game of cricket. The partnership of Kevin O'Brien and A Cusack of 162 is the biggest 6th wicket partnership of all the World Cups. I hope Pakistan win today.